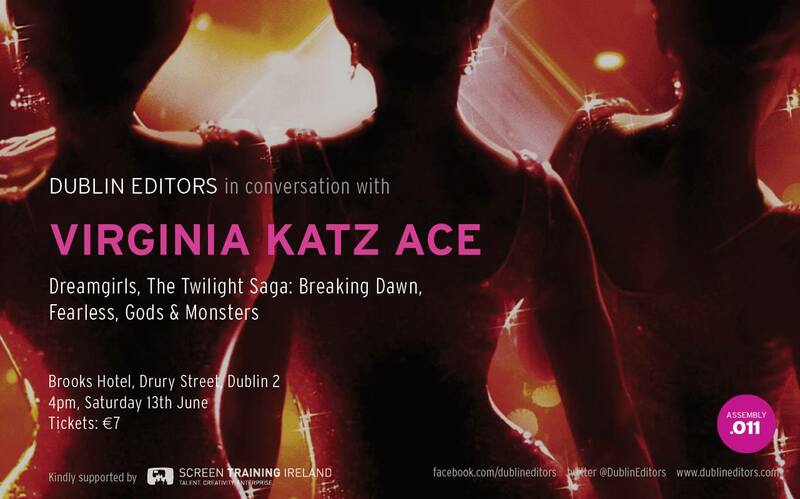 Dublin Editors are delighted to be welcoming Virginia Katz ACE to Dublin on Saturday June 13th as part of our ongoing in-conversation events. The talk will take place at 4:00pm in Brooks Hotel on Drury St in the heart of Dublin. It’s an excellent opportunity to hear about a career that spans twenty five years, and that ranges from Kojak to Dreamgirls. Email dublineditors@gmail.com with Assembly.011 as the subject to apply for a ticket. In 2007, Virginia won the EDDIE for best editing of a musical or comedy for her work on this film. If that wasn’t cool enough, Virginia also spent two years living in England working with Peter Townsend, of the legendary rock band, The Who, helping him establish his archival and educational film studio in London.